Depending upon your state of residence, either the Workers' Compensation review board or the private insurer will receive your application or a "Report of Injury" from your employer. You should have an initial decision regarding your claim within 4-6 weeks depending upon your state's regulations. This turn around time can be longer depending on how your state handles Workers' Compensation claims, and most importantly, the volume of claims currently being received. Each state provides a process of appeal for an unfavorable decision. Whether you are dealing directly with the review board or a private insurer, an appeal will be granted a hearing presided over by a Workers' Compensation judge, adjudicator, or mediator. It is highly recommend by both state governments and legal professionals that a claimant secure legal representation during this process. Due to the variability of state law with regard to Workers' Compensation appeals, it is recommended that you seek an attorney that specializes in the law regulating your geographic region. 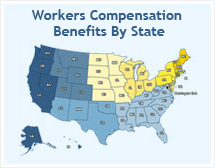 If you'd like help in finding an experienced Workers' Compensation attorney in your area to determine if you meet your state's eligibility requirements, click here. Receive a free evaluation of your claim, without risk or obligation.